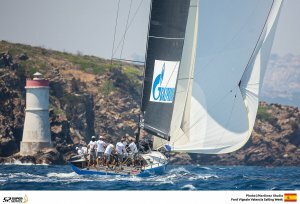 Vladimir Liubomirov’s Bronenosec crew won the first coastal race of the 2015 52 SUPER SERIES season to top the overall leaderboard at the Settimana delle Bocche, but only ahead of the ferociously consistent Quantum Racing by virtue of countback. While the regatta leadership swung from Azzurra to their twin sistership Bronenosec, Doug DeVos’ Quantum Racing stayed steady and held their second overall position, still tied on points with the top of the table, thanks to a solid, patient fourth place around the 31 miles passage race down the straits to round Spargi Island and the little Spargiotta islet to the west. If the course itself is well known to the grand prix fleets best sailors, a regular out and back trek through some of the most spectacularly beautiful landscape of any venue, one key difference today was racing in the SE’ly wind direction rather than the more usual NW and N’ly Mistral direction. So this meant a fast, close and exciting run down to the islands turn in the puffy, gusty 16-18kts of wind. But the Russian flagged winning boat set out their stall early, gaining the best advantage on the first 2.2 miles upwind leg. 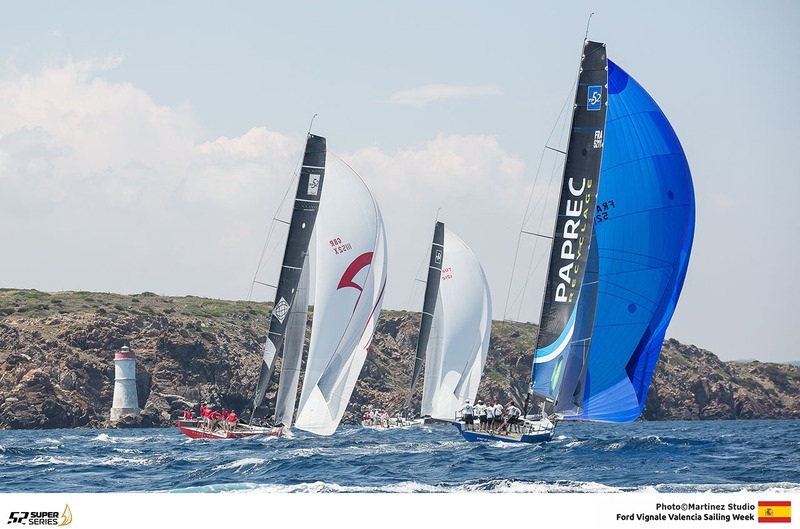 The strong Italian contingent on board the Bronenosec, backed up by Francesco de Angelis in the coach boat, put their faith in their belief there would be more wind pressure to the left, offshore on the first upwind. 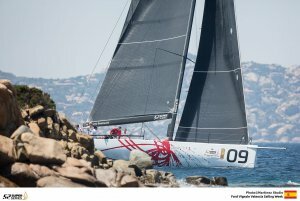 They timed their start nicely and were able to reap the dividend they sought, holding a solid lane in the best pressure to round the top, windward mark ahead of Quantum Racing with Tony Langley’s Gladiator round in third. 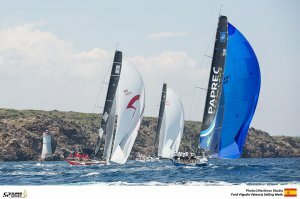 Downwind Bronenosec immediately capitalised working left, closer to the shore where they extended notably on the shift and wind pressure in the bay after Porto Cervo, while Tony Rey guided Provezza across the pack to steal second place as the race entered the straits, gaining the Turkish flagged team the key inside, inshore berth down the first section of this gusty, quick run. After getting bogged down in the traffic and suddenly losing places, Quantum Racing came back from seventh to fifth on the passage down to the island rounding, and were able to pass Gladiator when the bright red hulled British team had to take a penalty for fouling Platoon whilst beating back through passage between La Maddalena and Spargi. From there the positions were pretty much cemented. Bronenosec were almost untouchable for 95 per cent of the race, winning their second race in a row. Provezza closed distance momentarily in the lee of Spargiotta but there was no way to get close to them, while Quantum Racing continued to fight back at Platoon, half a metre at a time. Down the run the action was fast and furious, with little time to think and react with the nine boats very evenly matched. 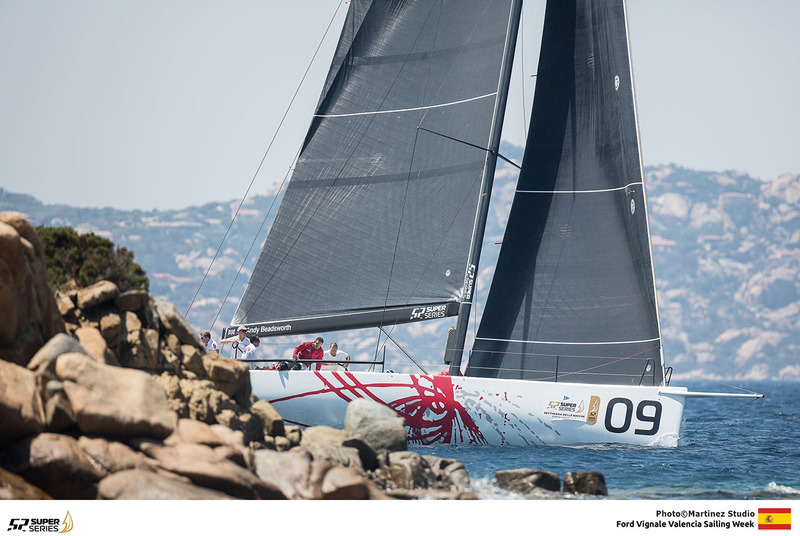 The consensus remains that the new Vrolijk designed boats are quick downwind but give way to the Botin designs upwind. At one point on the run the new Vrolijks were second, third and fourth – Provezza, Platoon, Gladiator – but in the end honours were more even, first and fourth to the Botins and second and third to the Vrolijks. As if to underline the tight, hard racing – as well as perhaps the need to take risks – in the nine boat fleet five penalties were given, or taken. 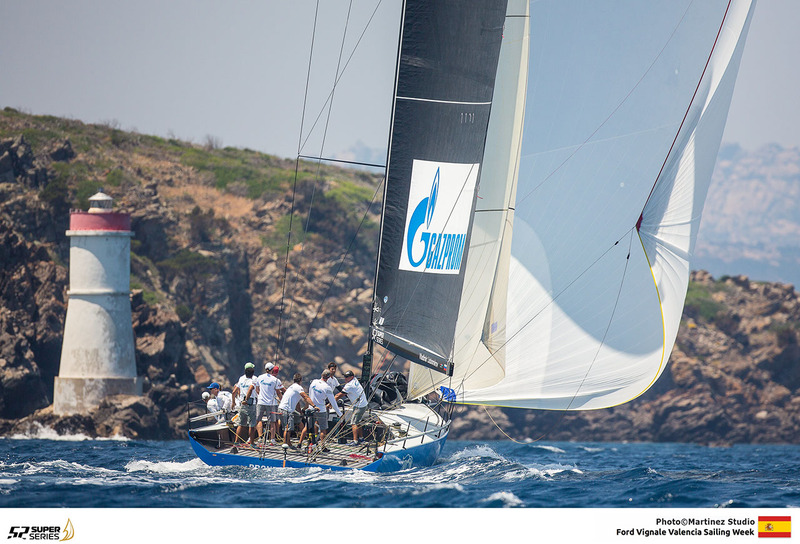 Azzurra recovered from a first penalty on the early part of the run to get back to second but lost their way badly by Palau and then were always on the back foot, finishing seventh today. We have been working on our starts and we got a great start and we had wanted the left and that is what we got and from there we went all the way left and managed to cross the fleet. That was a big part of the race. We know this place well, and we have a couple of guys on the team who know it especially well, this wind direction there is usually more pressure out there and the shift is quite small. The people underneath us to our right were dropping out of the pressure ever so often. We had a good lane and then after the top mark we decided to gybe early and start playing all the points. As we were going inside the Straits we were getting more and more pressure, the rich were getting richer and from there we had the luxury of being able to play the points as we wanted. For sure we are all happy and this gives us a lot of confidence but it is a long series with seven or eight races still to go, but it gives a lot of confidence after the first race yesterday (when they were ninth). We enjoy the moment. It was a good race. There were a lot of opportunities, we got some of them right and some of them wrong. We got round the top mark second and then gybed straight away and then got engulfed a bit in to the fleet and came out of that with only two boats behind us. We set the reset button and got a couple of good puffs downwind, we wriggled our way back up to fifth and then were there capitalise when Gladiator fouled Platoon and got fourth. So we hit our target for the day we were a little bit disappointed not to have stayed in second. But high marks to Doug and the guys for sailing the boat really well, we had the boat going really well up the first beat. We just ended up starting a little too close to Platoon. We started a bit on the back foot just a little. I think it is clear to everyone that the Botin boats have a little edge pointing upwind, but when we go downwind it is better. It is a good thing that so many of these races finish downwind. We are certainly on the upswing as soon as we put a kite up. We did well downwind with Andy (helm Beadsworth) and Stir Fry (trimmer Simon Fry) are doing a spectacular job downwind, just sailing the right angle at the right time. We have that whole package but took all of fifteen miles upwind to keep those guys behind us, it was not easy. It is a good result for us. We seem to be good on the coastal races, the more coastal races the better. Keep going downwind as far as we can go, down to Bonifacio and we will be happy!